It was so fun: yesterday I wrote a small article on creating a query on Foreign Keys refering a certain table. A post with content that I made up dozens of times in my Oracle carreer. And right away I got 2 good comments. One was on the blog itself. And of course Anonymous is absolutely right. So I added 'U' as a constraint type option. The other comment was from my much appreciated colleague Erik. 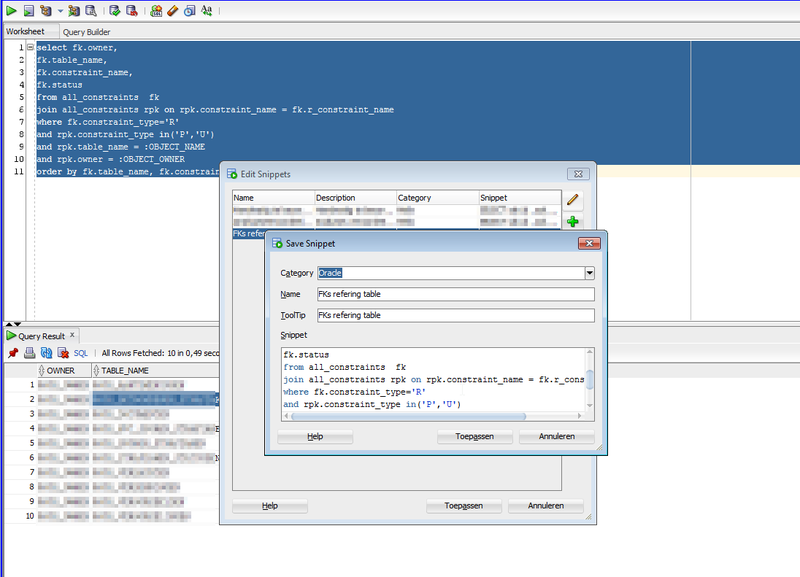 He brought this to another level, by pointing me out how to add this as a User Defined Extension in SQL Developer. But the tip of Erik is much cooler. He refered to a tip by Sue Harper that explains this (What, it's been in there since 2007?!). Note that I updated my query a bit. Cool stuff! And it's been there for ages! I modify your extension to view more information about parent/child constraints/tables.